Moonbeam is a 17 year old black and white paint. She has been with PARDS since May 2018. Moonbeam works in both our therapeutic riding and our public riding lessons. She is a very patient horse and is good for many of our active therapeutic riders. 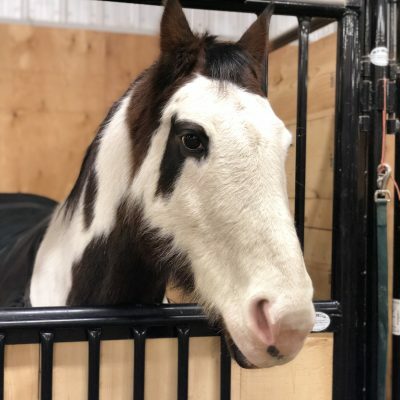 Moonbeam’s quiet and calm personality makes her a great fit for some of our riders who are working on their confidence and comfort around horses. Moonbeam is 15.1hh which means her gait provides a similar length and rate to the human walk. Moonbeam has a narrow and smooth gait which is ideal for riders with Cerebral Palsy, who may have tight adductor muscles, as it reduces stretching in the leg and makes it less difficult to balance. Her rhythmic gait also helps some riders with Autism Spectrum Disorder find the rhythm for trotting.